The RealAge Diet: Make Yourself Younger with What You Eat was created by Michael Roizen, a physician and author of the bestselling book, RealAge. Roizen introduces an approach to dieting that is based on the idea that we can decrease our biological age by making even small changes to our diets. He says that your dietary choices should be made based on the way that the food makes you feel and how it affects your health. Roizen promises dieters that when they become biologically younger by changing their diet, they will experience more energy and their appearance will improve. The book begins with a series of quizzes to help readers to evaluate their current diet and to determine their biological age. Roizen explains how certain diet and lifestyle factors can dramatically affect your biological age. For example, flossing your teeth every day can reduce your age by six years as can taking certain nutritional supplements. Roizen also analyzes specific foods and explains how they can either help or hinder your goal of becoming younger. He provides dieters with detailed dietary information and outlines the roles of protein, carbohydrates, fat, fiber, cholesterol and various other nutrients. The Real Age Diet also includes a chapter that evaluates many of the best-known diets such as Atkins and the Zone Diet. Roizen explains how these diets can be modified and made healthier using the RealAge principles. The book also contains two sets of eight-week plans. One of these is based around convenience foods and requires very little cooking. The other plan is based on recipes that are included in the book. 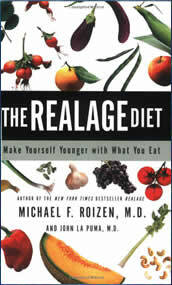 Throughout the Real Age Diet, Roizen offers simple and practical suggestions to help you improve your diet. For example, he says that eating a handful of nuts or another source of healthy fats such as avocado before dinner will help to slow down the absorption of sugars from your meal. He also advises dieters to drink a glass of red wine every day. All of these suggestions are based on scientific research. Fruits, vegetables, nuts, seeds, legumes, whole-wheat bread, low-fat dairy products, avocado, salmon, tuna, mackerel, chicken breast, soy milk, eggs, red wine, dark chocolate. The Real Age Diet recommends exercise habits that are associated with a reduction in aging which include walking for half an hour every day, performing aerobic exercise for at least 20 minutes, three times a week and doing at least 30 minutes per week of strength-building exercises. Roizen says that a balanced fitness plan can make your RealAge eight years or more younger. The RealAge Diet: Make Yourself Younger with What You Eat retails at $13.95. Emphasizes nutrition for health and not only for weight loss. Includes tips for eating out and on special occasions. Provides a choice of two plans to suit the dieter’s lifestyle. Recipes were created by John La Puma, who is both a doctor and a professional chef. Advocates a high intake of soymilk, which many health experts believe can have negative effects. Fairly restrictive and does not allow red meat. Not specifically targeted towards weight loss. The RealAge diet will appeal to dieters who are interested in learning how to adjust their lifestyle so as to reduce the effects of aging. It offers a convenient meal plan based on foods that are easy to access as well as general lifestyle recommendations that will help to control the factors that contribute to aging.